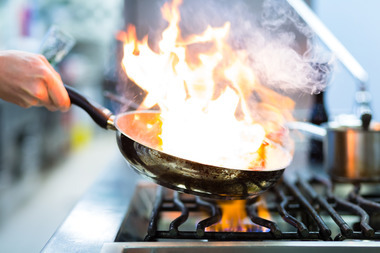 Ever wonder why restaurants need to carry so much insurance? Short answer: Food service is a messy business. Pretty much everyone has at one point or another fantasized about owning a restaurant. Putting your name on the front window, running the show from your own private booth, maybe even naming a cocktail after yourself. It sounds like great fun. But the fact is, food service is very a risky business. Case in point: More than 3,000 people die each year from choking on food that's been served to them at a restaurant. A full 48% of all food poisoning cases in the U.S. are caused by restaurant food. And more than 67,000 food service workers are seriously injured on the job each year, badly enough to miss multiple days of work. It's no surprise, then, that insurance coverage is a crucial part of the long-term success of each and every restaurant in this country. Without it, most food service businesses wouldn't last beyond their first serious incident. 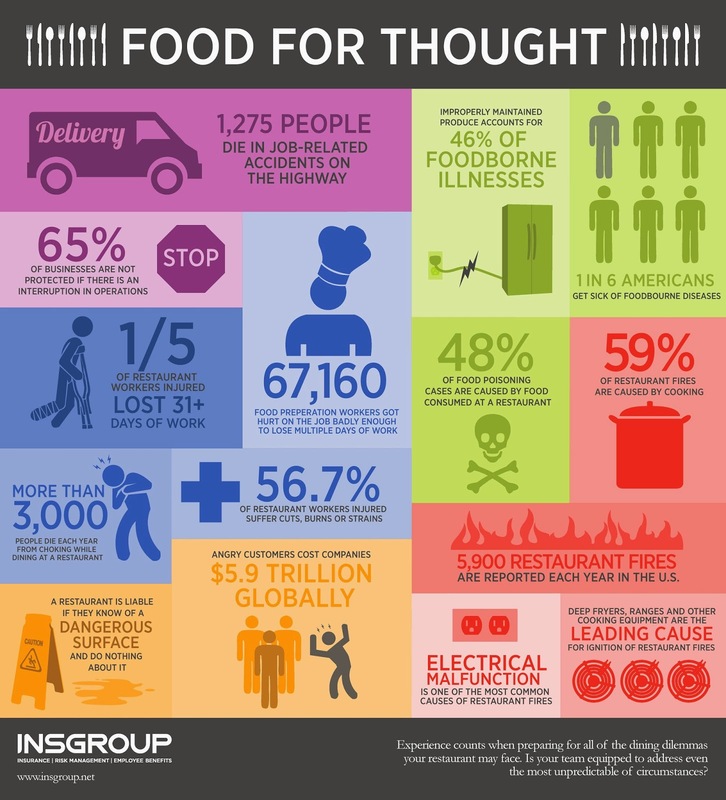 To highlight the wide-ranging impact that such coverages can have on a business, restaurant and hospitality insurer Insgroup recently released the infographic below summarizing some of the risks that owners face. Consider those restaurant ownership dreams squashed. Experience modifiers not only determine the rate a contractor pays for workers compensation insurance, they are often used as an indicator of a contractor's safety performance. An experience modifier that is higher than average will, in some cases, disqualify a contractor from competing for a construction job. Calculation of experience modifiers is a complex task, and errors and oversights are common. Contractors should obtain a copy of the experience rating work sheet and have it audited to ensure that the data reported by the insurer(s) to the rating organization is correct. Payroll dollars for each policy year should be reviewed and compared against final audited payrolls for accuracy. Likewise, loss documents for the policy years utilized in the calculations should be matched against the experience rating work sheet to ensure that all claims are reported accurately. We hear this question quite a bit. It might sound reasonable to assume that these two costs are the same. However replacement cost is usually higher than new home construction, even right after the home has been completed, and here are a few of the reasons why. Replacement Cost is what it will cost to rebuild the home with materials of like or similar quality, in the shortest amount of time and with a builder who is basically building the home as a custom-built house. Since only one home is being built there are no economies of scale that help to reduce the expenses for the builder. That means an increased cost to the homeowner for rebuilding the home over similar homes that are built as part of a development. Since there is time pressure to rebuild quickly, the builder may not be able to time the purchase of supplies and materials for better pricing. Since there is time pressure, the insurance carrier may not be able to wait for a less expensive builder—they may need to select whoever is available. Another factor that increases rebuilding costs over new construction is that builders that build developments may not do custom homes. These are often separate groups of builders. There would be pressure to rebuild and the choice of custom home builders available at the time that the home needed to be rebuilt might be limited. Depending upon the home’s features, the rebuilding cost could be an additional 10-30% or more even immediately after it has been completed. In some cases the home might go under contract months before it is actually built. By the time it is completed, costs have risen and the same home could not be built again for the same cost. We include cost data in every newsletter to help show trends and keep our customers informed about cost changes. In some cases the new home builder owns the land and makes a profit on the sale of the land to the homeowner. That profit is calculated into the sale of the new home. Replacement home builders do not profit from the land sale since this is not part of the rebuild. Therefore their profit from the rebuilding of the home may need to be higher. Were all costs included in the purchase price of the house or were they listed separately? These might include builder overhead, architect fees, upgrades to the house, and additional areas: garages, decks, porches, etc. Our replacement cost includes these costs and any additional areas that the user has included in the home’s description. Nationwide's "Brand New Belongings"- Cool Commercial, But What Does It Cover? Like me, you've probably seen Nationwide Insurance's widely aired commercial touting their service, "Brand New Belongings." The eye-catching ads feature a sleek Cat-Women-like heroine coming to the rescue in every homeowner’s worst nightmare situations, stealthily following behind home-invading thieves to replace the items they steal, or swinging into a fire-damaged apartment to switch out smoke-damaged valuable with shiny, new ones. The narrator explains these entertaining scenarios illustrate Nationwide's "Brand New Belongings" program, in which they "replace destroyed or stolen items with brand new versions," not just paying you their partial value. After the ad ends, you may be left feeling insecure about your current coverage. "If I don't have Brand New Belongings from Nationwide and I experience a loss, does that mean I'm going to be stuck with used, thrift store versions or my stuff?" Not necessarily - many policies from a variety of insurance companies offer the benefits extended through Brand New Belongings under the less catchy name "replacement cost coverage." Basically, this means that if you experience a loss or damage to your home or its contents, your insurance company should reimburse you for the amount it costs to replace the item with one of like kind and quality, not discounting the item's value based on depreciation (subject to the terms and conditions of the policy, of course). Replacement Cost Coverage is one of the two main valuation methods that can be applied when determining insured property's value, with the alternative method being "Actual Cash Value." If your policy is based on Actual Cash Value benefits, you will receive a payment not based on the amount you need to buy your same item in a store today, but the amount that the item costs minus any depreciation costs that apply based on the time you've owned the item. So while you may need $3,000 to purchase the same version of your stolen laptop, if you've had that laptop for a few years, you may actually only receive a fraction of this amount. As you can see, it's important to know which method your policy employs, because it will make a huge difference in the amount of compensation you receive in the event of a loss. While the premiums on the Actual Cash Value policies may be lower, it can lead to more expenses and a huge headache if you ever need to make a claim. Whether your policy features a valuation method based on Replacement Cost Coverage or Actual Cash Value, as with any of the elements of your insurance policy, it's important to read the fine print so you know what to expect. For instance, with Brand New Belongings, you will initially be reimbursed only with the actual cash value of your property. Nationwide will then pay you any additional funds once you purchase the new item out of pocket and submit a receipt. Also, in some cases, Nationwide will only pay to have a damaged item fixed, not replacing it with a truly "brand new belonging." Of course, if you look closely at the bottom of your television, you’ll see a standard disclaimer that "exclusions and limits may apply," too, which is where the grounds for a dispute can often arise. It is important to consult your policy for the details of your coverage. Keeping this in mind, you'll be in a position to hold your insurance company to their word and get all of the benefits to which your policy entitles you. b. The building where the “autos” are located is not protected with locked and secured openings. Before issuance of the policy, the insurance company inspected the owner’s property and it was apparent that the lot was unprotected. However, the next day, the insurance company issued a policy to the owner which contained the above exclusion. After this date, one of the vehicles was stolen from the owner’s unprotected lot. The owner filed a claim for coverage under the policy and the insurance company, in denying coverage, claimed that the theft was excluded from coverage because the vehicle was stolen from an “unprotected” lot. "There is a fundamental difference, however, between an enforceable exclusion that pertains to a particular kind of loss but leaves other coverage intact, and an exclusion that completely contradicts a grant of coverage. Colony Ins. Co. v. Total Contracting & Roofing, Inc., 2011 WL 4962351 (S.D. Fla. 2011) [23 Fla. L. Weekly Fed. D397a]. In order for coverage to be considered illusory, an exclusion must entirely contradict the insuring provisions. . . . the policy exclusion in the instant case, like that in Colony Ins. Co., does not entirely contradict the insuring provisions. All exclusions, by definition, exclude something from coverage, and to that extent will always contradict some aspect of a general liability insurance policy. The protected lot policy exclusion only excludes coverage of theft from an unprotected lot. The policy provides coverage for a myriad of other risks, including liability, personal injury protection, medical payments, uninsured motorist, and property damage. Refusing to insure all risk does not render an insurance policy illusory." Therefore, the court held that the unprotected lot policy exclusion was clear, unambiguous, and did not completely eviscerate coverage or contradict other terms of the policy. This case serves as an example of why it is critical for policyholders to be familiar with the terms and exclusions of their particular policies and to pay close attention to initial quotes from an insurance company which contain such exclusions. Unsure what your policy covers? Call us today at Bob Lancaster Insurance for a complete review of your Insurance.